Mr and Mrs Davies’ two sons, William and Maldwyn served in the AIF in World War I. Their daughter, Jessie Elizabeth Dempster lived in Western Australia. Drysllwyn at Auchenflower is an important building in the life of the Uniting Church in Queensland. During the years of World War II, the Davies family leased the property to Somerville House whose South Brisbane school had been taken over by the US Army. At the end of the war the property was acquired by the Methodist Church and converted into a hostel for country girls who came to Brisbane to work or study. It was renamed Raymont Lodge after Mrs Raymont who had made a substantial bequest to the church. When it was used for the training of ministers at the end of the twentieth century and the beginning of the twenty-first century, it was called Trinity Theological College. For a time it housed meeting rooms, offices and library facilities. 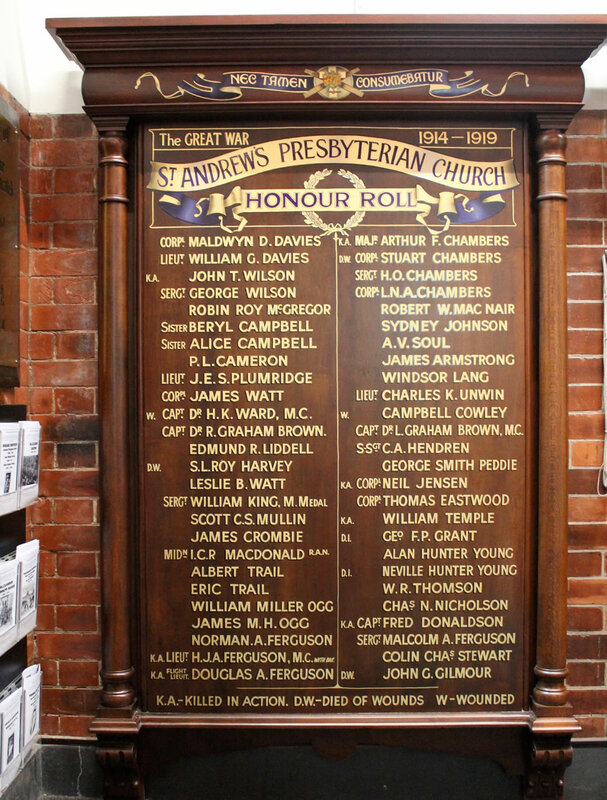 Drysllwyn also has an important link with Mr William Davies, a gold-mining magnate and Elder at Saint Andrew’s Presbyterian Church from 1908 to 1925. William Davies came to Australia from Wales when he was eighteen, firstly attracted to the gold fields at Ballarat, then moving to Gympie. Mr Davies purchased land at Auchenflower when he moved to Brisbane with his wife and son around the beginning of the twentieth century. He sponsored a competition to design a house to be built on his property at Auchenflower. The winning architect was Claude Chambers and the house was called Drysllwyn where the Davies family lived. In September 1918 a garden party was held at Drysllwyn. “It would have been difficult to find in any suburb in Brisbane a more beautiful setting for a garden party than the grounds of Drysllwyn the home of Mrs William Davies who kindly placed them at the disposal of the Hospitality and Arrangements Committee of the Presbyterian General Assembly,” the newspaper said. The function was attended by the Governor of Queensland and hundreds of guests including Brisbane church leaders and Assembly delegates from all parts of Australia. In the 1930s the title of the house was transferred from William Davies’ wife Eliza to Isabel, the wife of his son Maldwyn who was an insurance attorney. Now re-named Drysllwyn, it is used as a Kim Walters Choices outpatient support centre for survivors of cancer. The second son of William and Eliza Jane Davies was Maldwyn Douglas Davies, born at Gympie on 15 June 1893 and educated at Scotch College, Melbourne. He belonged to the Senior Cadets prior to the First World War and served in the 9th Australian Infantry Regiment (Moreton) and as Supervising Enlistment Officer in the 8th Infantry Oxley Regiment. On Wednesday evening, 1 July 1914 at Saint Andrew’s Presbyterian Church, Brisbane he married Isabel Martin Macdonald, daughter of Mr and Mrs John Macdonald of Moray Street, New Farm. Rev Dr Ernest Merrington officiated. The newspaper reported the couple motored to Redland Bay for their honeymoon. They lived at first at their new home Wynona quite close to Drysllwyn at Auchenflower and later moved into Drysllwyn. In later years they moved to Victoria Point and Hamilton, each time naming their home Drysllwyn. Two children were born before Maldwyn Davies. Working as a clerk, he enlisted in Brisbane for overseas service in the Australian Imperial Force on 5 April 1917. Driver M. D. Davies was attached to the Mechanical Transport Section at Broadmeadows before embarking from Melbourne for Glasgow in August 1917. Based at Parkhouse, he carried out duties in England till February 1918 when he proceeded overseas to France. He joined the 1st Siege Brigade Ammunition Column in France at the end of March 1918 and was appointed Corporal on 25 August. Corporal Davies was granted leave without pay to return to Australia via America at his own expense. He boarded SS Adriatic from Cardiff on 15 March 1919 to connect with SS Sonoma at San Francisco and arrived in Sydney on 28 May 1919. He was discharged on 25 June 1919 terminating his period of enlistment. Back in civilian life Maldwyn D. Davies became well known in the Brisbane community. He was the proprietor of Davies Motor Company Ltd, distributors for Standard and Bugatti cars. He was a keen motorist, a member of the Motor Traders’ Association of Queensland and an active member of the British Motor Traders’ Association. In 1934 Maldwyn Davies purchased a yacht Derwent which was 41 feet long with a beam of 12 feet and a rating of 8 knots. She was later stolen from her moorings at Newstead. After an aerial search it was found stranded on the beach near Ballina. He won a place in a regatta at Southport at the end of that year and the launch was sold to the Queensland Government in 1936 for £1200, to replace a launch used for fish and oyster inspection work in Moreton Bay. Maldwyn Davies accepted numerous leadership roles in community affairs including President of the Associated Chambers of Manufacturers of Australia, Deputy Chairman of the Board of Managers at Saint Andrew’s Presbyterian Church, Chairman of Directors of Brisbane Brick and Builders’ Supply Co. Ltd and President of the Queensland Lawn Tennis Association. During the Second World War he was Inspector-General of Administration, Defence Coordination Department and Chairman of the Queensland State Business Administration Committee. He was the Finnish Vice-Consul in Queensland in 1954 and President of the Australian Institute of Management. On 10 June 1967 Maldwyn Davies was awarded Commander of the Most Excellent Order of the British Empire for services to the community particularly to industry and commerce. Maldwyn Douglas Davies Esq CBE died in Brisbane on 5 February 1985 at the age of 91 years.